Yet another winner from Lyrita. This is a lovely CD for enthusiasts of music for harp, for lovers of English song, and an essential purchase for anyone who enjoys the music of Rubbra. Yet the enjoyment is tinged with sadness. Tracey Chadwell, whose voice suits the songs on this CD, had been diagnosed with leukaemia in 1990. She died on 12 January 1996, at the age of 36, less than a year after recording these ten songs. The CD is a fitting memorial to her talent. Her few recordings were all in English music, and her voice demonstrates intelligence and sensitivity to text allied to unusual beauty of tone. Listen to A Hymn to the Virgin and Jesukin, each from relatively early in Rubbra’s career. A Hymn to the Virgin is based on a medieval English text - also set by Britten. Jesukin has a text — also set by Samuel Barber, for voice and piano — by St. Ita, the 6th century Irish saint. The accompaniment to both is delightfully played and Chadwell’s singing has a simple beauty. The same may be heard in the brief The mystery. Rosa Mundi was described by Rubbra as ‘the point of departure for my future development’. The text is one that refers to the crucifixion and the piercings endured by Jesus. For this piece, Chadwell's tone becomes more austere, less evidently beautiful, more grave – and no less right. This absolute sensitivity to meaning is a special joy. The pieces for harp alone are played with delicacy. Pezzo Ostinato and the late Transformations, (from 1972) are substantial pieces, the latter one of the largest of Rubbra’s solo instrumental works. It has depth and profundity. Discourse for harp and cello is little known – like too much of Rubbra – and commands attention. 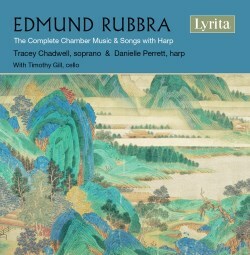 The two additional pieces, the Lennox Berkeley Nocturne, his only work for solo harp, and the Herbert Howells, here receiving its premiere recording, complement Rubbra’s work. Each demonstrates the beauties that can be achieved on the harp. Danielle Perrett is a wonderful harpist, with a magical tone and pinpoint accuracy. Recording quality is excellent throughout: the acoustic of the church at Toddington suits this music very well.